February | 2016 | Mike Lamberti, From Margate To Cleveland, And Back ! Having done my share of writing for nearly 41 years, I will admit there are a few stories that echo for a lifetime. When it comes to high school wrestling, there is, by far, one which stands out. 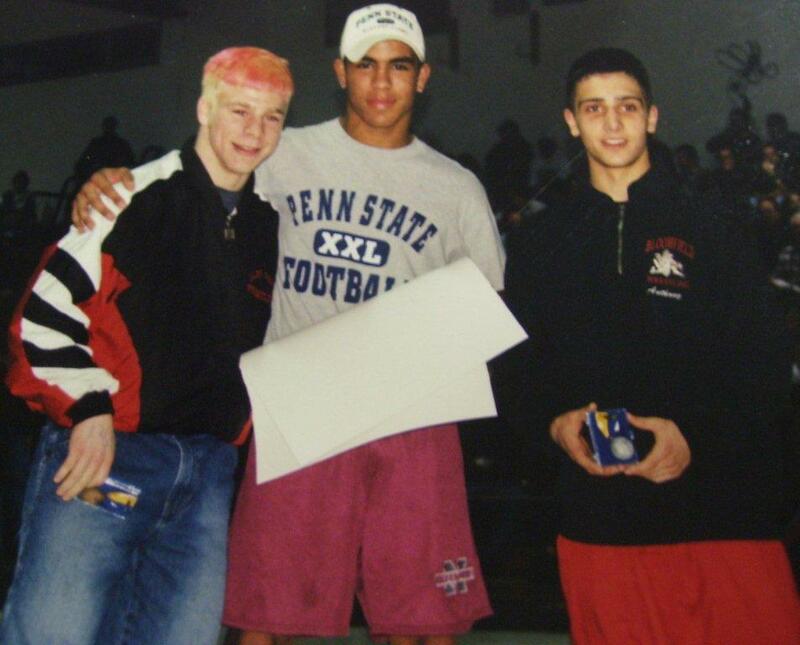 It happened 14 years ago and comes to mind specifically this weekend, as the Region 4 championships are once again contested in Northern New Jersey. Long after the final whistle sounded, and the cheering ended on a wrestling mat in North Jersey, three friends remain tied to each other, in part due to a weekend 15 years ago, that will forever bond them. It’s what makes high school wrestling, and its subsequent competition, so special. 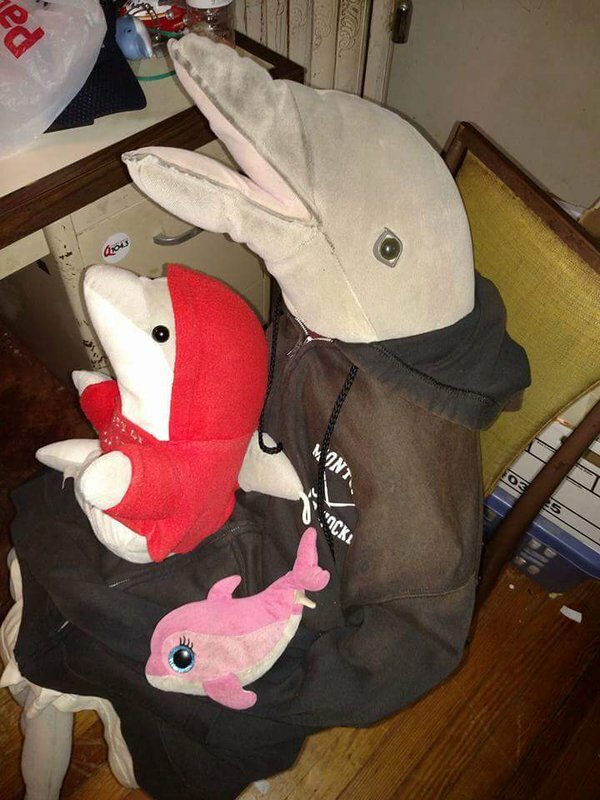 And while the friendship amongst the three had begun long before a fateful weekend in March of 2001, what occurred over a seven day period 15 years ago has forever changed their lives. It’s a story of courage, raw emotion and the ultimate victory which would alter Dubuque’s life and strengthen a friendship already cemented in respect. Dirk Phillips, Glen Ridge’s wrestling coach at the time and today the Glen Ridge High School principal, recalls the moment like it was yesterday. Dubuque hurried to an Immedi Center-type facility to get a clearance, which was obtained. As Phillips had said earlier, the protocol for head injuries today is so much different than it was in 2001. Had the injury occurred today, there’s no way Dubuque could have wrestled later in the day, and of course, the hope for a second straight state title would have disappeared. After defeating LaPorte, Dubuque had another hour to try and recoup before he faced Lou Rabelo of North Bergen for third place. Only the top three wrestlers from each weight class advance to the state championships, so there was just one way for Dubuque to qualify. The extra hour seemed to do him some good. His eyes were much clearer and he seemed more focused. On spec, the NJSIAA pushed the next round of wrestling, then called the super regions, back a day to March 7, in deference to the storm. Because Dubuque finished third in the region, he would need to win his first match at the super regions to assure himself a trip to Continental Airlines Arena in the Meadowlands that weekend for the state championships, then win a second time that evening for a chance at winning a second state title. Dubuque called Anderson, today a highly successful assistant wrestling coach at his alma mater, the nicest person he had ever met in the post-match press conference. He thanked his family and friends for their love and support. He would stand on the top deck of the podium that afternoon, and Montes would stand on the podium as well, having finished seventh in the state at 119 pounds. Reflection has been deep and somewhat painful for those who cared sincerely about the late Anthony LaRezza. We’ve heard from many former players and coaches, as well as life-long friends and appreciative acquaintances, on the lasting impression the Immaculate Heart Academy softball coach left. 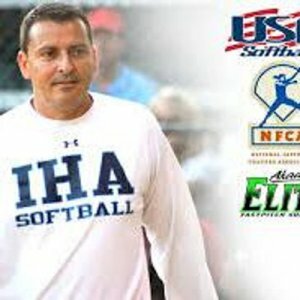 The latest to speak on his sudden passing and lasting legacy are perhaps LaRezza’s biggest coaching rival, Joe Leicht, the head softball coach at Indian Hills and Ashley LaGuardia, a phenomenal pitcher at DePaul High School, who is now a sophomore pitcher at Princeton University. Let’s start with LaGuardia. An incredibly intelligent young woman, a Valedictorian of her high school class who is now excelling academically and athletically at Princeton, LaGuardia had always shared a good friendship with LaRezza, even though she was usually competing against his teams. Ashley was informed of her friend’s death on Feb. 4, by her father, John, and needless to say, the news hit hard. She was able to put some words together tonight, remembering some great times. Ashley recalled a wonderful man in LaRezza, who was sincerely committed to her future success. “Although I never had the opportunity to play for him, LaRezza felt like he was one of my coaches,” said Ashley. “Whether it was playing IHA, or growing up through the years playing against Pride, I could always count on a good competitive game, followed by jocularity from him. 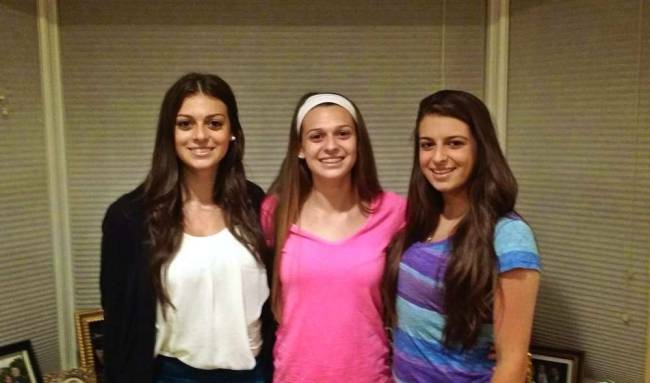 Ashley LaGuardia (far right) with her sisters Alyssa (left) and Amanda, counted LaRezza as a good friend and mentor. “He had a way with players and the sport of softball, that will make him a legend in the softball community. It was like I was one of his own players, and to this day I have the utmost respect for him. John LaGuardia, who never missed a high school game his daughter played, concurred. “It was one of the hardest things I’ve had to do with my kids, telling Ash about Anthony,” John said. “But I didn’t want her to hear it from someone else. Joe Leicht has put together a Hall of Fame high school coaching career. At Wayne Valley, he passed the 500 win mark earlier this season, as that school’s boys basketball coach. In the spring, Leicht coaches the Indian Hills softball team. In 2014, he guided that program to a state-best 34-0 record. He is closing in on 500 wins as a softball coach, too, and could hit that plateau in the next few years, making him a rare 1,000 victory coach. 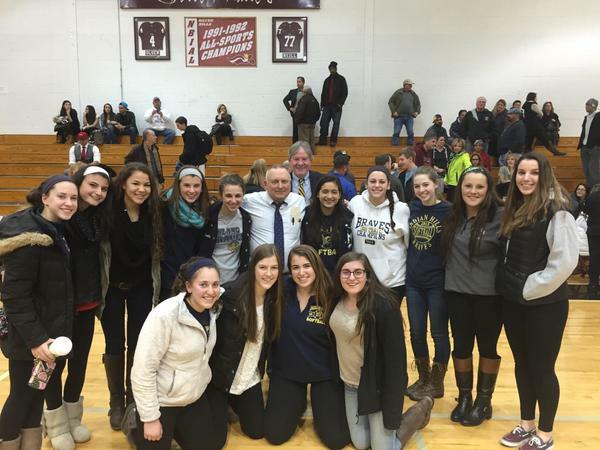 Indian Hills softball coach Joe Leicht was joined by his 2014 undefeated squad, after a Wayne Valley basketball game in early 2015. Leicht and LaRezza shared a great rivalry and good friendship. If you know Bergen County softball, then you understand the rivalry between Indian Hills and IHA is potent, to say the least. In the 2014 Bergen County championship game, IHA and Indian Hills met, in a battle of unbeatens. 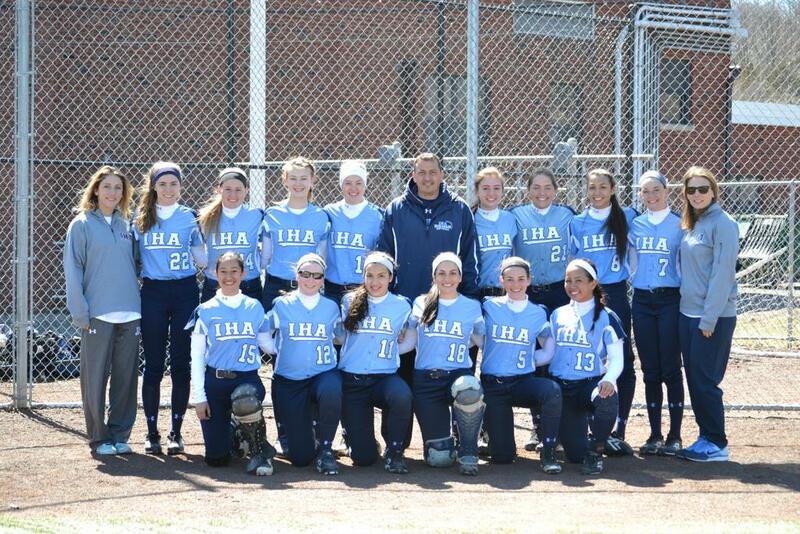 IHA led, 4-3, before Hills won it on a dramatic two-run, walk-off homer, in the bottom of the seventh inning. LaRezza would often say afterward that Leicht made it a point of reaching out to LaRezza to congratulate him on a great game, before joining his team in a crazy celebration. Leicht was coaching a basketball game today, but took a few minutes before the tip off, to remember LaRezza. “It’s just so hard to believe,” Leicht said. “Anthony wanted to win as much as anyone, but the way he went about his business was something you had to see. I always said for a Non-Public coach, he had a conscious. He was all about the kids, whether it was his team, or any team he’d play. There are so many kids on my team that thought the world of him. Anthony LaRezza will be waked at Biondi Funeral Home, in Nutley, on Feb. 8, from 2-8 p.m. The Funeral Mass will be on Feb. 9, at 10:30 a.m., with internment to follow at Glendale Cemetery, in Bloomfield. When you go to the number of New Jersey high school softball games that most us in the media cover on a yearly basis, some of the results can be forgotten, over time, past looking back at a specific article. But on May 19, 2015, I remember, well, going to a what appeared to be a routine game at Newark Academy of Livingston, as the Minutemen played host to Immaculate Heart Academy, on a warm, sunny afternoon. On paper, it didn’t look like much of a game. IHA was on its way to an eventual state championship, just a few weeks later, while Newark Academy was young and gaining varsity experience. 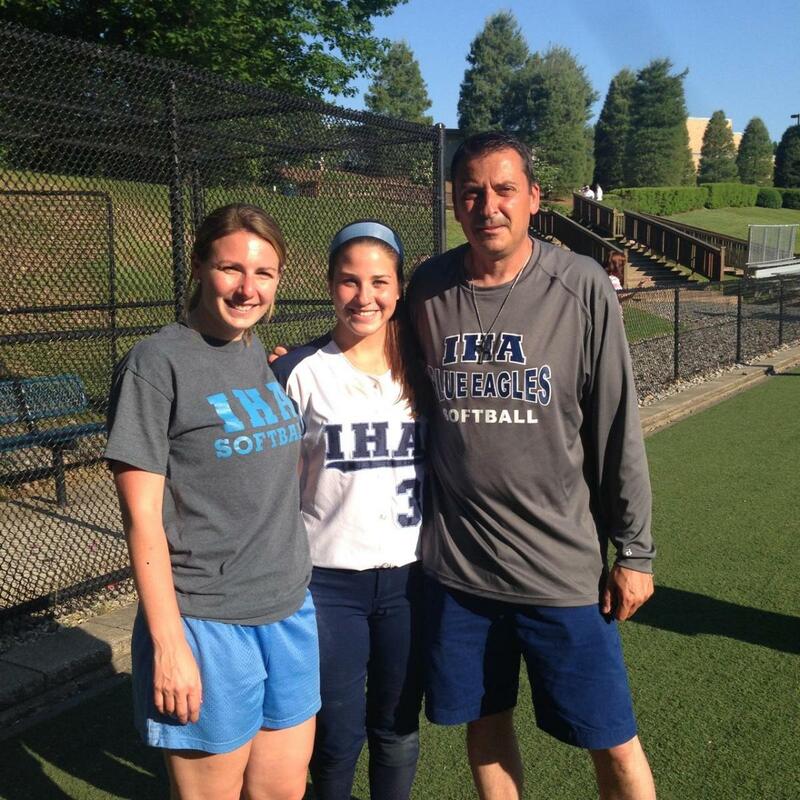 The late Anthony LaRezza, in this 2014 photo with the state’s all-time winningest pitcher, Stef Thomas (center) and assistant coach Diana Fasano, following another IHA victory. 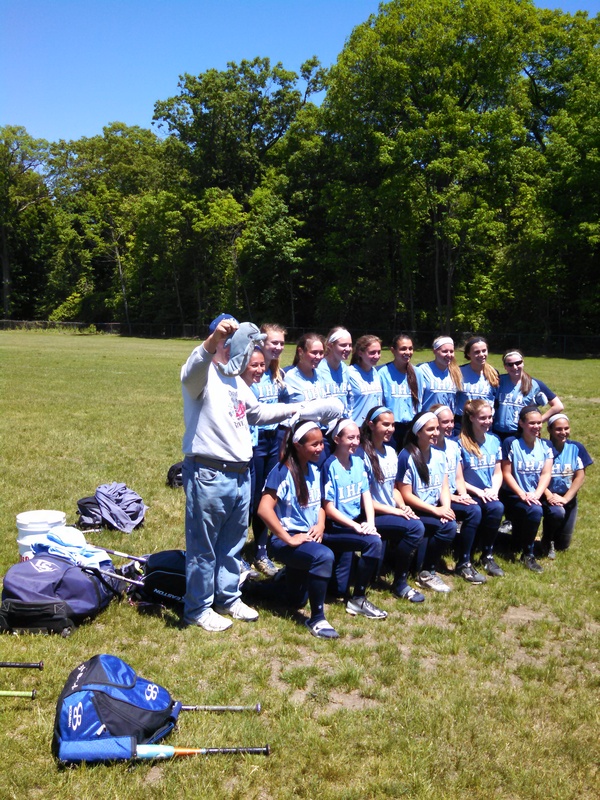 Perhaps the softball field at IHA will one day be named in LaRezza’s memory. I remember going to this game, because I wanted to see the two head coaches compete. Sergio Rodriguez would always convince you his Newark Academy team can play with any squad in the state while Anthony LaRezza would downplay his team’s chances. I remember spending a few innings on the Newark Academy side, and a few by the IHA dugout, and trying to keep a straight face was next to impossible. Rodriguez and LaRezza were as close as brothers. And in the early stages of this game, as Newark Academy stayed within a run through four innings, Serg was doing his usual magic act, pushing every button, while LaRezza was having a meltdown, basically saying his team stunk and they were destined to lose this game. Well, IHA would go on to win, 10-0, breaking the game open in the late innings. And afterward, there was Serg and Anthony, making fun of each other, and saying they’d catch up at the Franklin Steakhouse, in Nutley, sooner, than later. Fast forward to today, and a heartbroken Rodriguez could barely talk, when discussing his best pal, who died a day earlier, at the age of 50. “He impacted so many lives,” said Rodriguez of LaRezza. “I mean, I can’t believe he’s gone. And, yes, I hurt, but I really feel for those kids who never had the chance to play for him, and for the current team, that was looking forward to a chance at repeating a state championship with him leading the way. Rodriguez and LaRezza’s friendship went back a quarter century. “We met 25 years ago, at a softball game,” said Serg. “Anthony was coaching Project Pride, and one of the players on the team was my then-girlfriend. We started talking at a game and really never stopped. He was eight years older than me, but we hit it off right away. Rodriguez played his high school ball at Newark East Side High. Later, he began coaching the Pride, with LaRezza, from 1996-2006, before taking on a new summer team. The two had talked about reuniting and coaching together again in the summer. Both Rodriguez and LaRezza are dads. Serg’s eldest daughter is already in college, playing softball at Rowan University, while he has two younger sons, in elementary school. Anthony had a young daughter, whom he adored. Serg admits he’s pretty numb. “People tell me that the pain will subside,” he said. “But I don’t see how. Everything I do, especially coaching, will remind me of Anthony. I can’t imagine going to a (summer) tournament, and not seeing him there. Thirty five years from now, if I’m lucky to be around that long, I’ll be thinking of him. Phil Delgado’s coaching style is wearing his emotions on his sleeve. 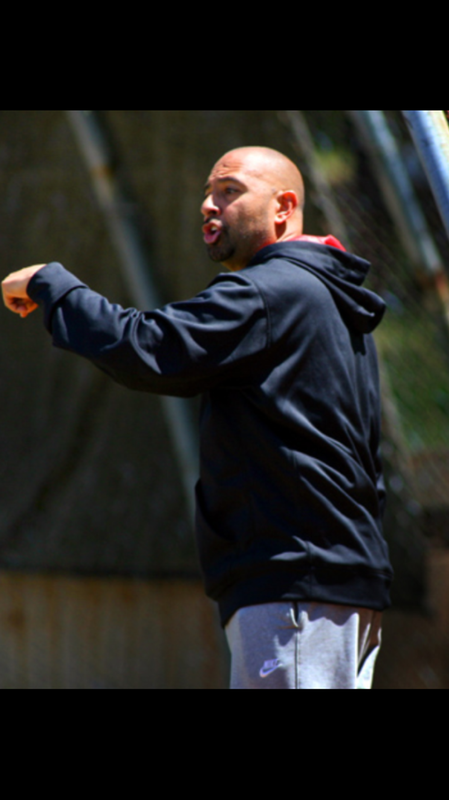 His passion for the game and love of teaching his players the proper way to play consumes him. That same passion is also directed to his family and friends. And when someone he loves has departed this life, that emotion is evident for all to see. 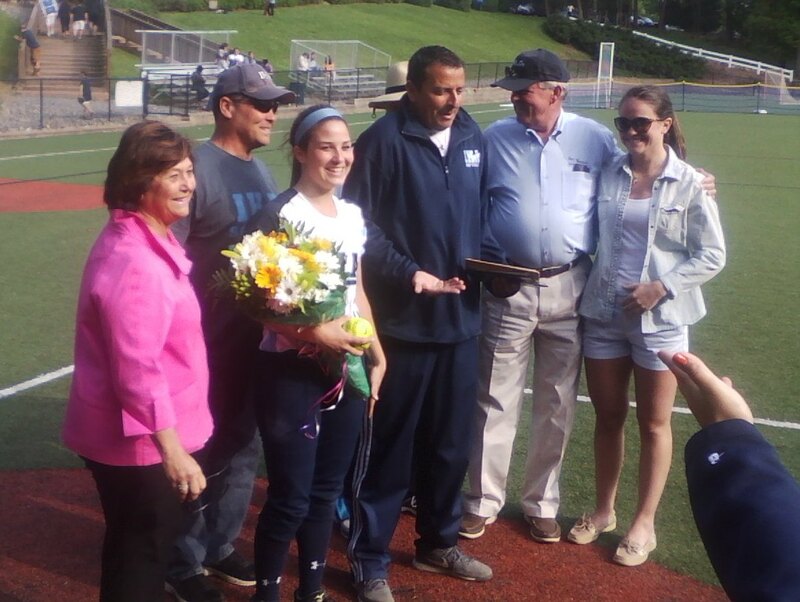 So, when news of Anthony LaRezza’s passing became known, Delgado, the second-year head softball coach at Montclair High School, was quick to credit a man who did so much for his professional career. Mike DiPiano, the head girls soccer and wrestling coach at Nutley High, as well as that school’s assistant softball coach, also recalled a good experience with LaRezza. “My girls, Lyndsay and Jessica, never had the honor to play for Anthony,” he said. “They were always in the other dugout. However, their five years of travel ball and high school ball in New Jersey would not have been as memorable without meeting and becoming friends with Anthony. Win or lose, we would always look forward to our talks and our shared laughter with Anthony! He was a great guy, who cared about his girls and the world of softball. Ed Bates’ pals are sad tonight. 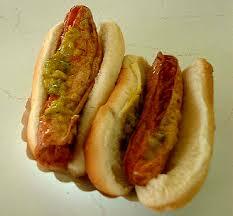 LaRezza was always good to Ed, often driving him to games. Just another, in a long line of those who are saddened this night, by the loss of a legend. I had just picked up the phone to call my friend, Jason Daily, the head softball coach at Livingston High School. I didn’t want to bother him, during work hours, and wasn’t sure he’d be able to pick up his phone, but on the second ring, he was there. Jason must have known something was up. I didn’t want him to read, somewhere, that his friend, Anthony LaRezza, had passed away today. The game was scheduled to be played at Ivy Hill Park, but was rained out and never made up. Daily had the highest regard for LaRezza, who returned that admiration many times. As news spread today, the friends, players and coaches turned to social media to express sadness, but also to say thank you. Zullo’s assistant coach, Mike DiPiano, echoed those words. LaRezza’s final game as a high school softball coach was a state championship last June. “He left us way too soon,” said DiPiano. The Mount St. Dominic softball program tweeted its condolences. IHA and the Mount had some marvelous games over the years, but the friendships enjoyed by the players was always paramount. Raritan softball coach Aado Kommendant wrote a beautiful tribute, on Twitter. West Essex’s star pitcher, Sami Huetter, was also devastated. Jim Stoeckel, III, who contacted me with the news, spoke like a true coach. College softball teams quickly extended their condolences. Former IHA players quickly posted pictures they had of Anthony. In everyone, LaRezza had that special smile, indicative of a man who loved working with kids. “This is just incredible news,” said MaryAnne Dondarski Loperato, whose daughter, Ally, played for LaRezza at Montclair Kimberley, in 2004, when it won a state title. Lopreato’s daughter, Nikki, played for LaRezza’s ‘Pride’ squad and another daughter, Gianna, was a player on a college exposition team that LaRezza coached. Newark Academy coach Sergio Rodriguez said his life will never be the same again. Other high schools teams in New Jersey, including Wayne Valley, Wayne Hills and Mahwah, sent their thoughts. During the season, the competition is fierce, but on this day, it’s about friendships and relationships. The reactions will continue for days to come. 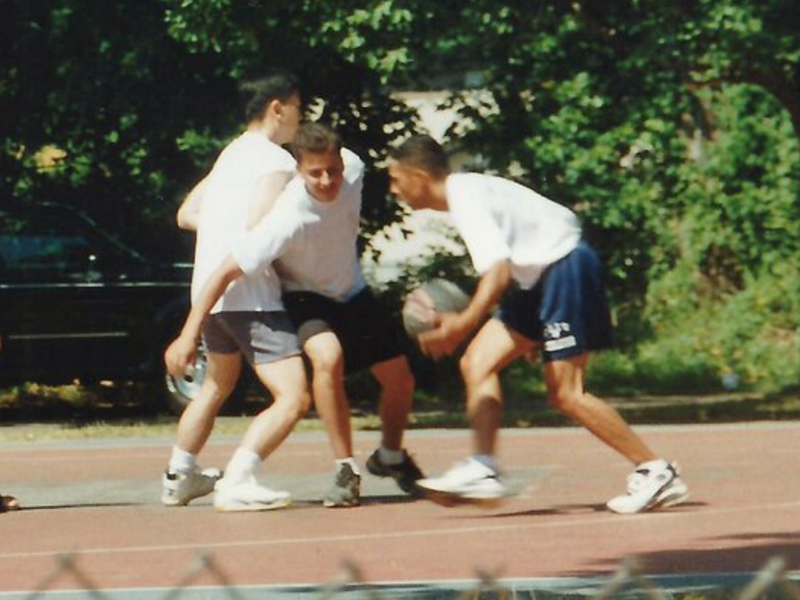 Anthony LaRezza was a friend to many, a mentor to thousands and a role model for a new generation of athletes. His influence will not soon be forgotten. There are moments where words will never tell the true story. Such is the case today, as the news of the passing of Anthony LaRezza shuttered through. The news came with the subtlety of a sledgehammer. Anthony’s faith had guided him, as he worked through some health issues. He never wavered, instead he did what he loved most, which was coaching high school softball. Immaculate Heart Academy was Anthony’s stomping grounds, as he guided that program to greatness, including the 2015 NJSIAA, Non-Public A championship, with a team of all underclassmen. Photo by Sean Reilly…Anthony celebrating another state championship last spring. What a moment. 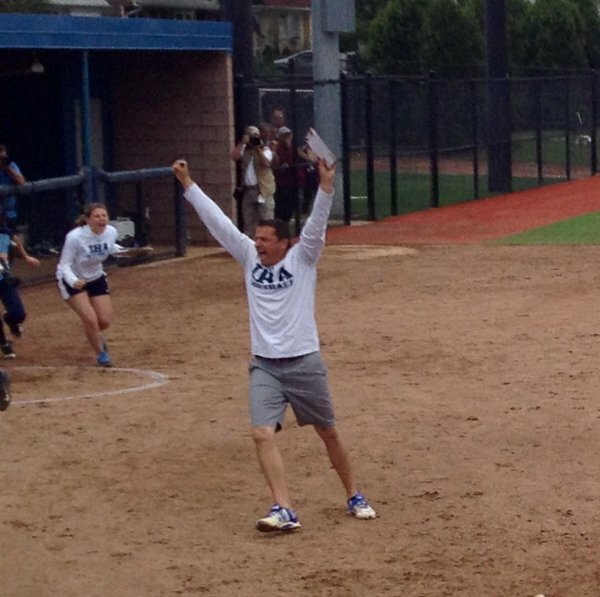 There was that moment, when the winning run scored in the state final, at Kean University, where Anthony jumped up and down in pure joy, as IHA won, 1-0, in extra innings. Anthony had coached state champions before, but this team was special. And has he celebrated with the kids, on the field, drenched in Gatorade, he was quick to remind those kids that 2016 would be just as good. I’ve written about him for years, on this blog. We had more fun at his tournaments than one deserved to have. We talked about sports trivia, movie trivia, horse racing, and anything else that popped up. But when it came to his players, man, that was special. Anthony and I had just spoken recently. He called to let me know that he would be going through some treatments, but that he and I would be meeting up soon, at Rutts Hut, for some rippers. Anthony loved that place. I had taken him to Rutts, a few days after the state championship last spring, to celebrate. Anthony loved coaching IHA. Ed Bates (second row, far left) was his friend, too. Pictures will tell a much better story of Anthony. This was a fun-loving guy, but also a devoted parent. He was the constant whirlwind. LaRezza’s 2015 IHA team would win what some called an improbable state championship. But he always had time to say hello. He always made sure to congratulate an opposing team, win, or lose, on Twitter, after a game. The last tweet, on Jan. 26, was perfect LaRezza. It was about a softball game, of course, and the ultimate goal to raise money for cancer research. There was always a goal, always a motivation. 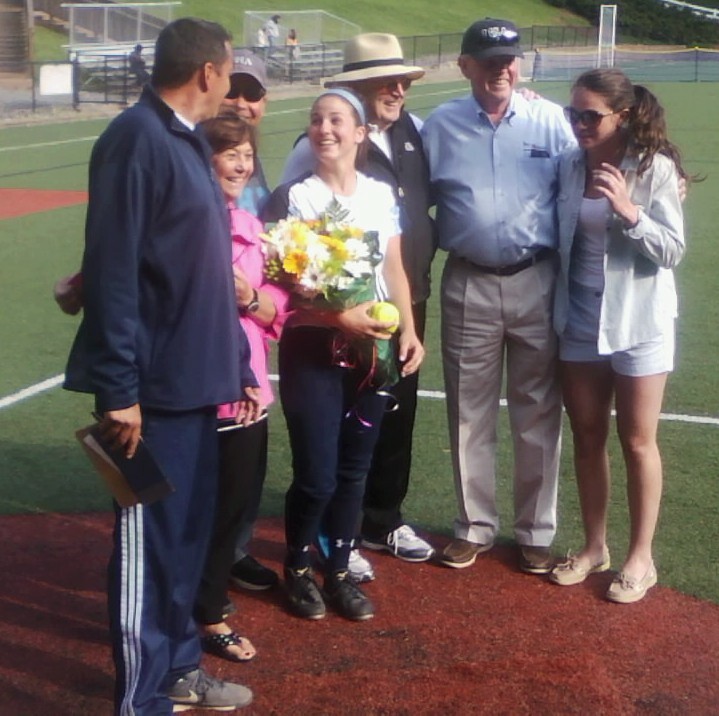 It was a special day in 2014, when Stef Thomas won her state-record 113th game for IHA. I’ll miss this man more than I can ever describe. I’m not quite sure how I can go to a softball game this spring, and watch. However, the last thing Anthony would ever want is for anyone to feel bad. Anthony LaRezza was so many things. But most of all, he was a man. He stood for decency, integrity and, having a lot of fun. 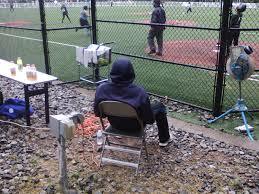 Typical Anthony, taking in a softball game, even if his team wasn’t playing, at IHA. I still want to call your cell and hear you say ‘hello’. Or just get a text from you. 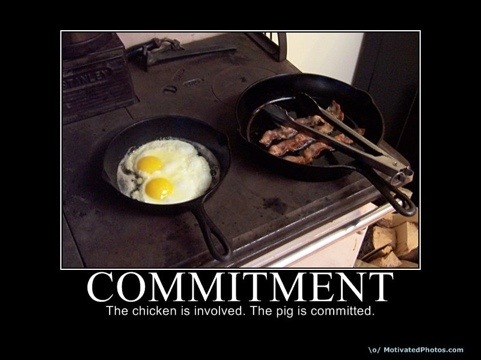 LaRezza often liked to tell the story of the chicken and the pig. I always believe God has a better plan. And sometimes, we are faced with surprises when He calls someone home. Anthony always believed that, and I feel somewhat happy in that Anthony will flash that smile again. And one day, we’ll all see each other. He always loved my horse racing analogies, especially calling Stef Thomas, Affirmed. 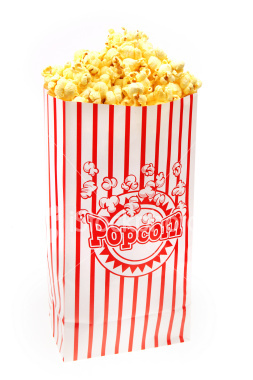 And Anthony always got a kick out of my ‘get your popcorn ready’ quote, for a big softball game. Thank you, pal. I’ll never forget you.